Neon Flowers is a custom built OpenGL live wallpaper, with 100% unique graphics! This Live Wallpaper will not drain your battery. 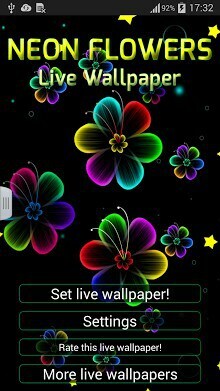 We bring you our latest live wallpaper with awesome colors and beautiful flowers. 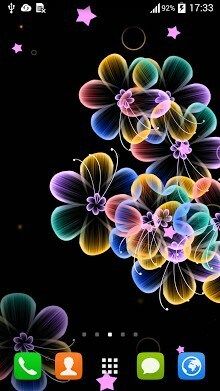 DOWNLOAD NOW Neon Flowers Live Wallpaper and enjoy! Custom built and native coded, this live wallpaper is optimized for very low battery usage! Created using OpenGLES, you will get the most fluid, most battery-optimized experience for your phone. This Live Wallpaper offers with touch events. Swipe or tap the screen to interact with all the different elements. The design of this live wallpaper is 100% unique, created by our team of artists. You will not see any similar design in any other live wallpaper! We have tested this live wallpaper on a multitude of Android phones. If you have any problems using it, please send us an email at themesartistic@gmail.com and we will assist you right away! We’re eager to chat and receive your feedback! If you like this live wallpaper, make sure you rate and comment! It’s the only way to support our continued development of live wallpapers!